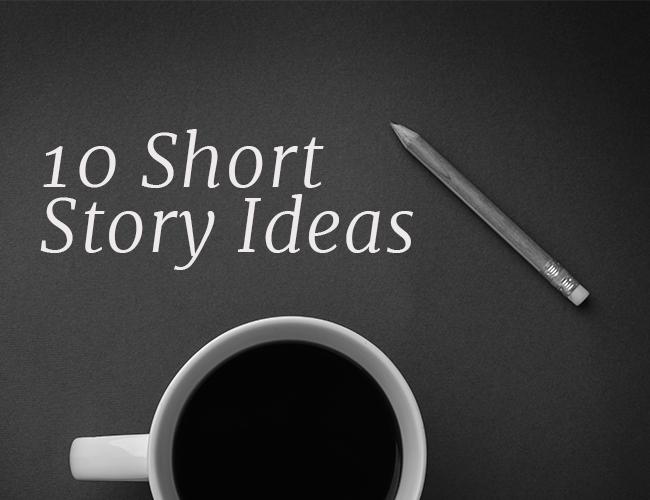 Most writers have too many short story ideas, not too few. However, therein lies the problem, because the more ideas you have, the harder it can be to choose the best one. The best short story idea in the world won’t help you if you don’t write it, and a mediocre idea can be made into an award winning story if it’s written well. Stop worrying about finding the best idea and choose one that’s good enough (or even an idea you’ve already started). Your goal isn’t to have the best ideas, it’s to have the best short stories. That’s why this list is so short. Some websites give 44 story ideas, 100 ideas, or even 1,000, and while that can be fun, it kind of defeats the purpose. More ideas won’t help you if you don’t write them, and they might just distract you from your true purpose. With that in mind, why not use these ten short story ideas to write your first ten stories, one per week, over the next ten weeks? I promise you, your life will look totally different if you do it. Good writers don’t cover up their wounds, they glorify them. Think for a few moments about a moment in your life when you were wounded, whether physically or emotionally. Then, write a story, true or fictional, involving that wound. In 2011, 20 short stories were published in Best American Short Stories. Half of them involved a character dying. That same year, all 13 of the novels shortlisted for the Man Booker Prize involved the theme of death. 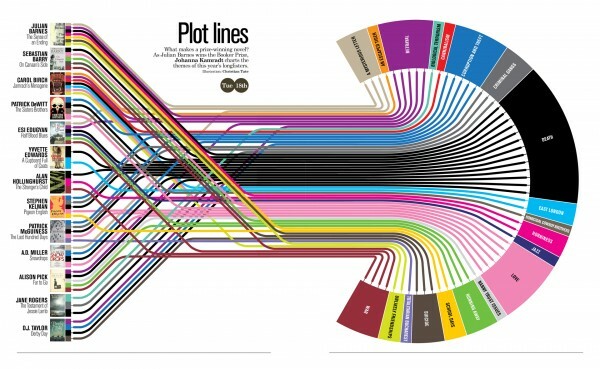 Think about your favorite films or novels. How many of them either show a character die or have the character’s dealing with the death of another. Good writers don’t turn away from death, which is, after all, the universal human experience. Instead, they look it directly into its dark face and describe what they see on the page. Pop quiz: What do Harry Potter, Superman, Cosette from Les Miserables, Bambi, David Copperfield, Frodo Baggins, Tom Sawyer, Santiago from The Alchemist, Arya Stark, and Ram Mohammed Thomas from Slumdog Millionaire have in common? Beside the fact that they are characters in some of the bestselling stories of all time? Writers love orphans, and statistically they appear in stories far more often than in the world. Orphans are uniquely vulnerable, and as such, they have the most potential for growth. It’s time for you to write a story about one. Read more about why you should be writing stories about orphans here. One more pop quiz: What do Edgar Allen Poe, Ron Weasley, King Saul from the Bible, Odysseus, and Ebeneezer Scrooge have in common? Each of these characters* from literary classics saw ghosts! Even if you don’t believe in ghosts, they make great stories. Have your character find one. Need more reasons to write about ghosts? Check out our article, 3 reasons to write about ghosts. Whether it’s a friendship or a romantic relationship or even the relationship between a parent and his or her child, write about the end of a character’s relationship. “Every story has an end, but in life every ending is just a new beginning,” says Dakota Fanning’s character in Uptown Girls. While it might feel like you’re writing an ending, remember that this end is the opportunity for a new beginning, both for your character and your story. Ready to get writing? Get our workbook 15 Days to Write and Submit a Short Story for a step-by-step guide through the process. “Why bats, Master Wayne?” asks Alfred in Batman Begins. We all have pieces of ourselves we’re trying to hide. You do, and so do the characters in your short stories. However, your characters’ secret fears and insecurities are actually the source of their power. Dive into them and you’ll unlock a captivating story. Your character’s biggest fear is your your story’s secret weapon. Don’t run from it, write about it. For more, read our article When You Don’t Know What to Write, Write About Your Insecurities. This storyline is one of the seven basic plots, and it describes the plot of some of our favorites stories, including Cinderella, Aladdin, Great Expectations, several of the parables of Jesus, and even Harry Potter and the Sorcerer’s Stone. However, not all fortunes are good. As Tolstoy’s short story How Much Land Does a Man Need? and John Steinbeck’s novella The Pearl illustrate, sometimes discovering a fortune will destroy your life. 8. A character unexpectedly bumps into his or her soulmate, literally. In film, it’s called the meet cute, when the hero bumps into the heroine in the hallway, knocking her books to the floor, and forcing them into conversation. In another story, they meet on a bus and her broach gets stuck on his coat. In another, they both reach for the last pair of gloves at the department store. What happens next is an awkward, endearing conversation between the future lovers. First, setup the collision. Then, let us see how they handle it. This is the plot of Gravity, The Odyssey, and Lord of the Rings. It’s fun because who hasn’t been longing to get to a destination only to be delayed by something unexpected. In Flannery O’Connor’s short story, “A Good Man is Hard to Find,” a family is on a road trip to Florida when they get into an accident beside the hideout of a murderer who had just escaped from prison. What happens next is one of the most famous encounters with a monstrous criminal in short fiction. Monsters, whether people who do monstrous things or scaly beasts or a monster of a natural disaster, reveal what’s really inside a person. Let your character fall into the path of a monster and see how they handle themselves. Want more story ideas? Want to learn how to execute those ideas better, and get your short stories published? 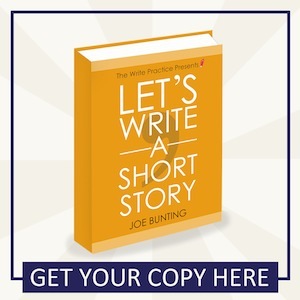 Check out this book Let’s Write a Short Story, a guide that will get you started writing and publishing short stories. Get it here. Spend a few minutes today thinking about these 10 story ideas and coming up with a few of your own. But before you start writing, try testing out your idea by sharing it with a friend, your writer’s group, or even our online community Becoming Writer. If the people you share it with aren’t very excited about your idea, consider reworking it or even starting over. If they start getting visibly excited about the story, on the other hand, then you know you’re onto something. A writer who is inexperienced with women suddenly gets the courage to date not one but two women—the old friend who had twice rejected him and a barista he’s long been attracted to—but after several months of balancing them, both relationships end leaving him alone. I then posted the idea for feedback in Becoming Writer. And the feedback I got not only helped me see I had a promising idea, I got more ideas from members of the community about how to make the story even better. As I wrote the story, I was more confident because of the feedback I had gotten, and when I finished, the story turned great. Once you have your idea, join Becoming Writer to test them out. Oh, and if you join, here’s the link to mine if you want to share your feedback! I’ll be there ready to check it out. How about you? Do you have any short story ideas? Share them with us in the comments section! No, it should be Teresa Agnes from The Maze Runner series! Yo, It’s Nessa Brooks. The competition sHoOK! These girls up on me, I got’em with a hook. Can you put up more of these there sooo cool and really come in handy. TYSM I really needed this for my english assignment! Again Thank You! These ideas are great! Lets try more korean though. Can post something about points of views in the future? Is it a good idea writing different povs? CAN U PLEASE MAKE MORE IDEAS THESE ARE REALLY GREAT AND IT HELPED WITH ME ENGLISH ASSIGNMENT!! How would I describe shadow people for my story? These examples helped so much. They inspired me to mix some up a bit for my English homework. Same here, needed one for class and this really helps! thank you soooo much this is soooo great!!!!!!!!! OK, I have an idea for a story. I already have the world and some characters done, I just need a driving force. Some sort of conflict to get things going. Any suggestions? Yeah, this ideas really made my stories more interesting. Thanks joe. Beautiful tips and topics to begin for a hesitant writer like me. Believe it or not, I would love to read your barista love story. Omg. Why didn’t I find this place sooner?! Yes, these Ideas helped me to write a story for Danish. really i had no a idea!!! Hi, peeps. Loved this article and it helped me! Subscribe to my youtube channel Zacharyzaichik!!! It’s a cool gaming channel that I created 8 days ago. I’m trying to become an author, so I took three of the ideas and combined them together. I am almost finished with the book, which is called Final Frontier. P.S. Yeah, the ideas are great!!! Yea, right. I find this site better than the others out there. I know. I was so lost for ideas after getting a new notebook, but now I’ve got some good story ideas. Thank you to the person who made this page. I think 6, 7, 8, or 9 are good for me. I’m going to try them out and see how it goes. I did too, it’s some great info. If your gonna say something bad then don’t say anything at all Antoinette. Are you saying that orphans aren’t real? No, we don’t. Maybe you think we should, but don’t be mean about it. Having ghosts or monsters that don’t exist in real life are for fictional stories. You don’t believe in fictional stories? That’s great! But hating them and shouting that out in unnecessary. So, please, just, don’t be mean. This stuff is an excellent starter and idea giver! Thanks ;)! I’m a young writer, and these idea’s really shook me, and got me to writing. Thank you, i hope you will give more idea’s soon. Great ideas. I hope I’ll be able to submit something every week on the Writing Practice. Although not easy to do, it’s a great incentive. Talking about writing means nothing, if it’s not put down on pages, and shared with others. That is exactly what I do, can you tell me some ideas for stories? The one rule I use when writing a short story is the always entertaining ‘ordinary people in extraordinary situations’, Morgan. This is a website 4 story ideas!!! – Story about a Spy who’s life had been rough before due to all of his/her spy work and now there is one final assignment that could mean that they could have a new life. I really agree with your first statement. It’s not that I lack ideas, but it’s another thing to devote the precious time it’s going to take to develop them into stories. I feel like I have to envision a good end before I start. I believe there are lots of lumps of colorful clay out there but which one should I take into my hands today, work with, and mold into into pottery? It won’t just happen. However, as you say, maybe it really doesn’t matter as much as I think. I love your owl picture!!! Great article!! Thank you for the ideas. All awesome ideas. I wanna write something magical and imginative and these are all great ideas for the story of my characters, but i need like a concept still????? But i guess i cant get that from anyone else except me. How about a group of people divided into different faction based on the type of magic they can do. And there is one girl or boy who stands out from the others like have to do more than just one like?? I love that idea!! !I hope you don’t mind if i use it! It just means that he loves the ideas posted! For long many years now,I’ve been working on my novel. I’m fully convinced to tread the short story route as many successful writers did. That means I have to get my stories into the open for critique. I wish to join Becoming Writer. I have sent my e mail.Now I am on waiting list. What next? I love your passion, Ohita. If you can I always recommend people finish what they’ve started. If you think you can finish your novel, do it. But if your stuck, try writing a short story on the same topic as your novel, or with the same characters. It might be a great way to get unstuck. As far as Becoming Writer, we’ll send you an email soon with more info. Thank you! Thanks for the help,even though I am 10 I want to write short story that everyone will love to read. wait– do u study in nis? I definitely know what you mean by having more ideas than you can write about. For me, at least, I think it is a good idea to have all the ideas, for I am one of those people whom has trouble keeping my mind on one thing and jump around from one topic to the next. When I get writer’s block on one story, I go to another idea, and start composing that story, until an idea for the first story emerges. Also, if I need help trying to find an angle that my story needs to go in, I daydream about what my characters may or may not do. For example: Chris is a boy, who has a birthday the night of his senior prom. If I am stuck as to what he does, then I daydream…1st scenario, he goes to the birthday party thrown by his parents, and has a good time…In the 2nd scenario, he goes to the prom, and gets to dance with the girl of his dreams….The 3rd is where I try to combine the 1st two, so everyone is happy. But if you have tried to unsuccessfully to urge your writer’s block to disappear…The best thing you can do is not try to force it…Just simply do nothing, but go out and enjoy life…Inspiration will show itself when you least expect it. The idea for the wounded character, is a great one and the one that really caught my eye. Everyone has their faults, pains, phobia’s and tragedies. I want other’s to know they need not have to make up some disease none have ever heard of. I use my own for the traits of my characters. Also, I believe if the author injects humor into the equation and can get the reader laughing with them about what they think of those wounds, then just maybe, the story will help to heal the wounds of all. as far as ideas go for me, i get inspiration for story ideas from little things- like a sentence. I could build a story from a sentence; but big things, like somebody’s parent dying, I get inspiration for simple conversations etc. from things like that. I love your passion, thank you .! I need weekly practice. I had the goal this year of writing one short story a month and submitting it. I have written four, as of June. It takes me so long to figure out the outline. If the real thing I need is more practice, then I need to get working at it. I also have a wattpad. It seems to be a very good way to get your work out there. This becomes a very handy place to put stories such as; short stories, novels, and fanfiction. This not only helps you develop your writing especially if your best work currently is just fanfiction, but to get an understanding of what you can work on and grow with to become a better writer. I have a wattpad too. I agree totally, its a really good way to get books out there and get people reading them. OMG I have Wattpad too! What’s your account? Thank you for the information, Joe. I plan on writing 10 short stories in the next two months and I am going to use 1 of your points for each story. I have the ideas in my head, but your article gave me a blueprint to follow. Thanks again. I have an idea of a story but should we make up muthical creatures or is would it be more likely people would enjoy it with creatures already made. Even if it was just the name I was going to make up. What’s your opinion guys? I love writing novels and have started quite a few in the past few years. The problem is, most are fan fiction and include characters from other stories, because I can’t seem to really make up my own story lines. I have a couple of novels that are my own ideas, but otherwise I just can seem to make anything up. I have a couple of short stories and did a short story workshop at my school, but I can’t figure out the story line I want to use for my next one. I like stories with a lot of drama, like kidnapping and all that sort of stuff, but I just can’t work out what to do! And I would love to send in chapters of my novels and my short stories if possible to. It would be great to get some professional feedback! That actually sounds really cool. I never would have thought of the teenage girl getting kidnapped at a graduation party 🙂 Thanks! Okay, I need someone’s opinion. I am thinking about writing a story about the mirror realms; Assia and Gehenna. Assia being the human world, and Gehenna being Hell/Demon world. What do u think? what is the purpose for having Gehenna being below the ground and Assia being earth? And what would be the outline of the story? I think maybe it would be better if you had the human world Assia be slightly different than our world and Gehenna be different than the Hell that is generally known; when you say demon world that sounds more interesting to me because- I dunno- the thought of a place full of demons is creepy. Sounds a bit like The Blue Exorcist to me. you need to read “the last lecture” by randy pausch if you haven’t already. it was written by a professor who was terminally ill with cancer at the time, and is all about fulfilling your childhood dreams. I have so many good stories, but with no endings, can’t seem to get to that point. I know what the ending is going to be, but can’t get it on paper. My pen and computer literally fight me, anyone else with this problem?? I am 14 years old and in the 9th grade. I needed something fun to write about for a creative writing report. I found this website and fell in love! I have now gotten a 100% on three of my reports! WOW! That’s amazing, Jayce. Congratulations, and thanks for sharing that with us! it’s really amazing. it will definite enhance the power of thinking in writing short story. congralulations. it’s really amazing. it will definitely enhance the power of thinking in writing short story. congralulations. I have so much idea for stories. I begin to notice the similar in them. If you have great idea for start of story and end of story then you will have great story by connecting them up from begin of story toward the end. That is what i get so many good ideas. Really good ideas, especially the injury/orphan one. What! those ideas are not crap you should read them and go for it!. These aren’t just ideas. These are realizations. I’m loving all of the prompts. Thank you. I just started writing. Well, not really, I have been writing my whole life but I just decided that this is going to be what I want to do for the rest of my life. I am going to go through them one at a time and use it as more of a challenge. Write a story for each one, once a week. I’m working on the first one. Tell the story of a scar, whether a physical or emotional one. We will see how it goes. These are great at triggering lots of memories and ideas. Thanks! this helped me so much with my english assignment thank you so much Mr Bunting!! hi neha my BFF and yes those people are crazy and FAKING their name!!!!!! hello joe i love this website. did you make others? thanks cookie i love your videos you are the best toy youtuber EVER!!!!! I feel very much encouraged in this, honestly i am not a writer but through this kind of discuss i see myself writing such an interesting short story,, thank you. I love writing and when I’m older I want to be an author yet sometimes I get writers block and thanks to this website I can finally start writing with confidence again , with these amazing ideas to help me. Writ about some horses who get lost in the amazon! Action and the short attention span are the hallmarks of the American zeitgeist, but history won’t necessarily be kind to this type of writing. Genre writing is entertaining, literature transforms you in some unspeakable, eery way. on Great post. I just stumbled upon your blog and wanted to say that I have really enjoyed browsing your blog posts. In any case Iâ€™ll be subscribing to your feed and I hope you write again soon! I love this site. It is very helpful with trying to find a story idea. I hope there will be new ideas soon. I will have to show this site to my writing club. Love this website, I used these ideas on the Game Episode my story is called The Comic. Great ideas! This helped me write my fictional story for a story writing competition. It turned out awesome! For school I entered a WRITE NOW! contest, I have no clue what to write about…. ANY SUGGESTIONS??? Maybe a human who has done wrong and is punished by having to fight demons all by themselves? I am writing a lot of stories right now but I think that it’s great to have lots of ideas because you have lots of chances to write about completely anything. However, I’m only 9 and most of my stories are about horses, so don’t mind me if you disagree, but I did skip prep for a reason!!!!!!!!!!!!!!!!!!! Cool, I write about dogs lots!!! I think im gonna use the idea of the main character litterally bumping into their soulmate, but there will be a catch….. The guy died two years ago after he was shot in his heart. These are some really good ideas. these are really interesting comments. I need a short story idea that involves a little bit of love. can you help me? what genre does my story fit into if it is about a girl who is literally radioactive and is on the run from people who wants to kill her and gets helped by a boy who she ends up falling in love with? I was planning to write a story but couldn’t find an idea,but this was really helpful! I wish there was more journey ideas that are kinda funny like missions. i was read Your character discovers a ghost. it’s really outstanding. Be careful what you wish for. it sounds more exiting. I grab my overstuffed duffel bag from the boot and race toward the fence leading to the beach. The grey rocks are splattered a creamy-yellow with near-sprouting lichen. Under them are the brightly colored, orange-brown weeds, with white sand sprayed across the water and rocks. You could see the water all the way to the bottom, as clear as light viridescent bottle-glass. If you looked closely, you could see starfish and sea-urchins sleeping lazily on the wide pieces of flowery pink coral. I paused for a second to breathe in the sea breeze, the seaweed and the salty sting of the water in the air. I couldn’t wait any longer. I leaped into the ocean. The icy water froze the toes that had been warm just a second ago and the water swallowed my head as I dove down. I could taste the bittersweet, salty, cold water running down my throat and I came up for air, not wanting more water being accidentally swallowed. I could hear the water smashing against the yellow-white sand, the joyful squeals of small children and adults as they watched their kids have fun, and the soft swishes of my feet in the water. Suddenly I started to shiver. It was too cold in the water. I hopped out and raced toward my mum, who was setting up the umbrella and towel. The hot ray of sun slammed onto my freezing body and my drenched hair slapped against my wet back while the hot sand squelched in between my soaked toes. After eating a delicious lunch of ham and cheese sandwiches, I stood up. It was time to go exploring. I ventured into the forest that lay beyond the beach. I stopped suddenly and gasped. Lying on the smooth green grass was a rowboat, streaked with layers of dirt and made of aging wood. The paint swirled off the boat like carrot peelings. It didn’t look like it deserved to be sailed by anyone, but it was too late. I hopped enthusiastically into the boat after pushing it near the water’s edge. I sailed out far on the ocean, bobbing on the sun-dotted water, my eyes locked on the skyline, where blue met blue. What do you guys think of that? Is it good? WWWWHHHHHOOOOAAAAA!!!!!!!!!!!!!!!!!!!!!!!!!!!!THAT. IS. SO. GOOOOODDDDDODDDDDDD!!!!!!!!!!!!!!!! THAT IS SO GOOD!!!!!! WRITE MORE!!!!!!!!!! i was so stuck on what to write about. i had to write about a day in the life of a blade of grass i got a few ideas…thanx!! these are all great ideas, however i cant seem to be able to come up with one or even how to start. This actually gave me a good idea! The going on a journey and running into something or finding something out seems fun. I want to put mystery, survival technique, and a type of tested human being from scientist in another world in my story. I hope my idea also helps other people too. These are all my favorite types of things I can put in a movie or book! Mi llamo Paco, Guajolote. Igualmente. This has really helped me with ideas for my English assessment coming up! Thank you! This helps me a lot to practice my writing skill, thank you! Hey, call me thunder! or if so lightning its secret who i am i might be your computer! very informative ideas I am also writing a short true story that wounded me and my family too much. I think I might try one for fun. I didn’t know that readers enjoy orphan stories, and writers enjoy writing about them. Thanks for making this!! Thanks for the ideas! I have considered becoming an author many times. Guess i have until college to choose my profession. YOUR PAGE WAS SOOO HELPFUL! THX! this helped me with my homework heaps!!! I love this website! It gives me so many ideas for stories!!! This gives me an idea! Thank You! Desde aquí te cantamos, can I get my VISA? Really? Has nobody noticed that a professional writer has written “Instead, they look it directly into it’s dark face and describe what they see on the page” – using “it’s” instead of “its”? Thanks Gareth! Good catch. Everyone makes mistakes (believe it or not, even professional authors)!